The hit BBC TV series hits the world of comics! This special debut issue features a story written by Captain Jack himself! 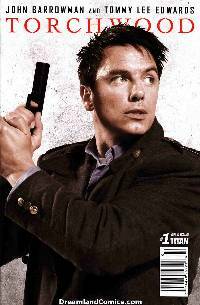 Actor John Barrowman (along with his sister, Carole) brings you the story of 'The Selkie', as mysterious deaths strike a remote Scottish island. Art is provided by acclaimed artist Tommy Lee Edwards, currently working with UK star Jonathan Ross on the Image comic series, Turf . In the second half of the comic, we bring you part one of a special five-part story, as Jack, Gwen and Ianto becoem trapped in a cosmic hotel! Plus, an old villain from the TV series returns... "Broken" is by Torchwood TV script editor Gary Russel and artist Adrian Salmon.